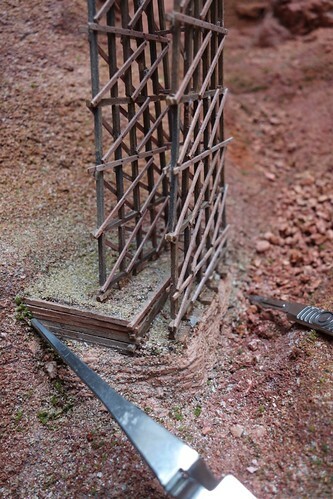 A wodge of modelling-clay was then squeezed into shape, building-up around the foam-nail heads and respecting the lines marked out in pen. 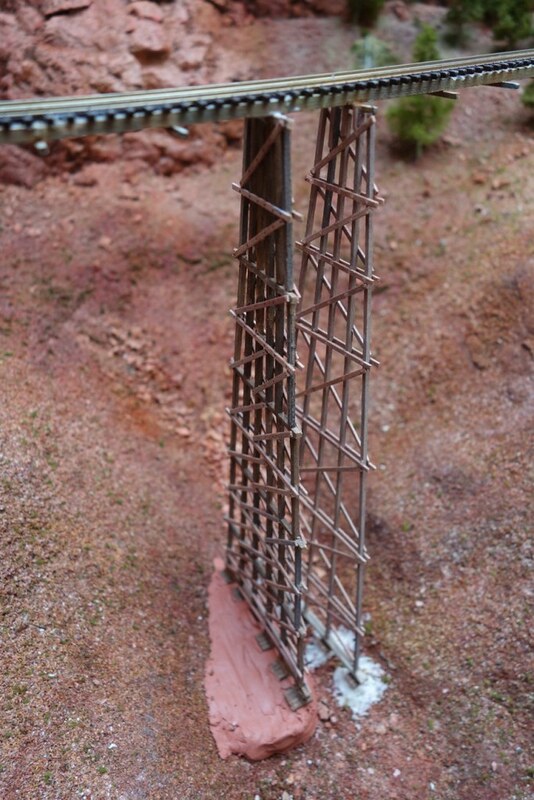 And the bent finally fixed in place, glued at the top and wedged into the clay at the bottom. In the photo below you can see to the right the original bent made to the old-style design, which is still holding up the track, but due to be removed in due course. 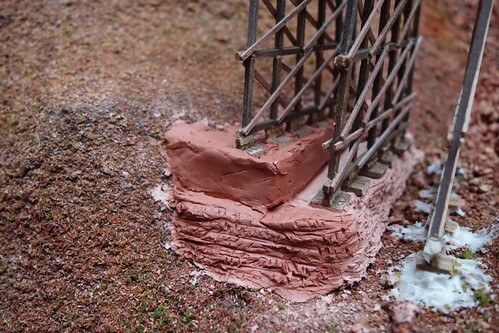 And finally, a close-up of the modelling-clay as it dried out, marked up to represent the loose stone wall that can be seen in the still from the film “Breakheart Pass” (which is my “prototype”). 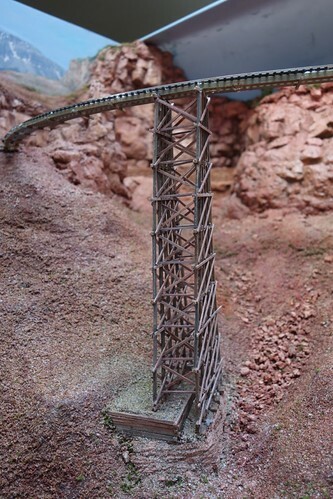 The wait has been worthwhile - the new Trestle and the clay formation at its base look superb - many more to go? Meanwhile I had completed constructing the second bent of “authentic” design and installed it to the left of the first such, using the same kind of model-clay technique; but this time with flat vertical surfaces which could then be clad in scale 12 x 12 timbers as per (more or less) the prototype (see reference photo at end of previous entry). The original “inauthentic” bent was then surgically removed and the ground-cover made good around the base of the two authentic ones. 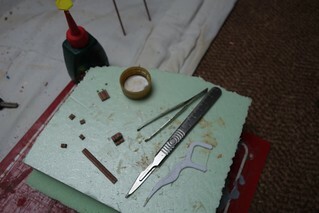 The cross-braces and girts were then measured, cut, glue-dabbed and tweezered into place, working from the top down and from the back to the front. A fiddly job, but not as frustrating as I though it might be. 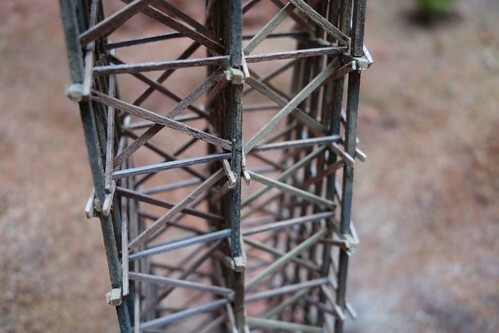 Note that the dimensions for the rear-most set of parts are slightly smaller than those for the front face, because of the curved nature of the trestle. But they are consistent from the top to the bottom of each face, allowing for some handy mass-production. Lots of re-measuring and checking as I went along (and even then some wastage). But now I have my first complete “tower” (two bents and their connections)..! 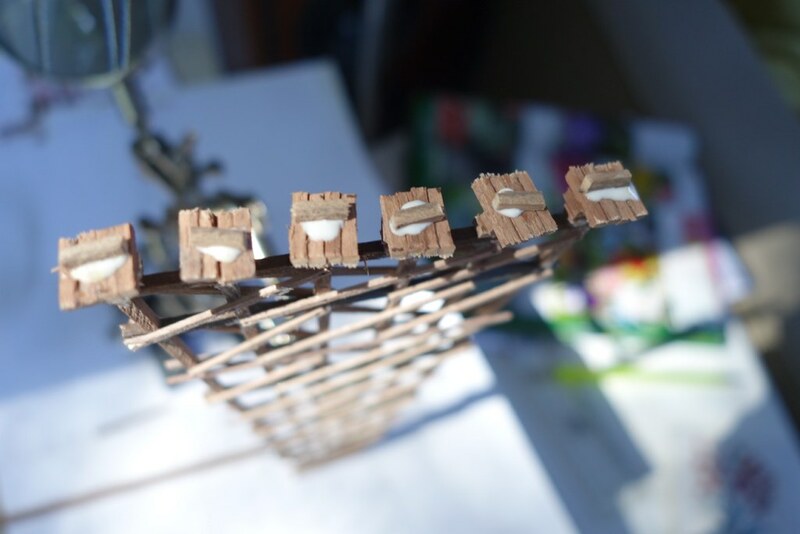 I have been much struck by the strength and stability of the resultant construction, given the minute-ness of the glued overlaps and the fragility of the component timbers. It says much for the functionality of the prototype design! 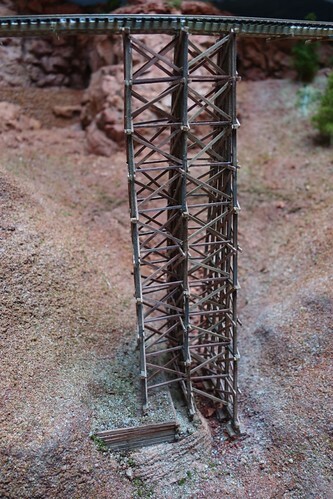 This first “tower” has been completed just in time for me to go away with my wife on yet another week’s holiday, so there will be yet another long pause before the next instalment, but I am determined to keep going – and keep reporting. The third “authentic” bent has already been constructed, ready to take the place of the “surgically removed” one. Looking good Jim, enjoy your holiday. There has been a further rather prolonged period of non-progress on the model, with social & domestic commitments as usual being to blame, including trips away. 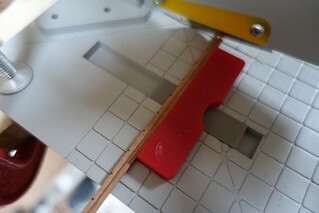 However, the third bent has now finally been installed, using much the same techniques as before. 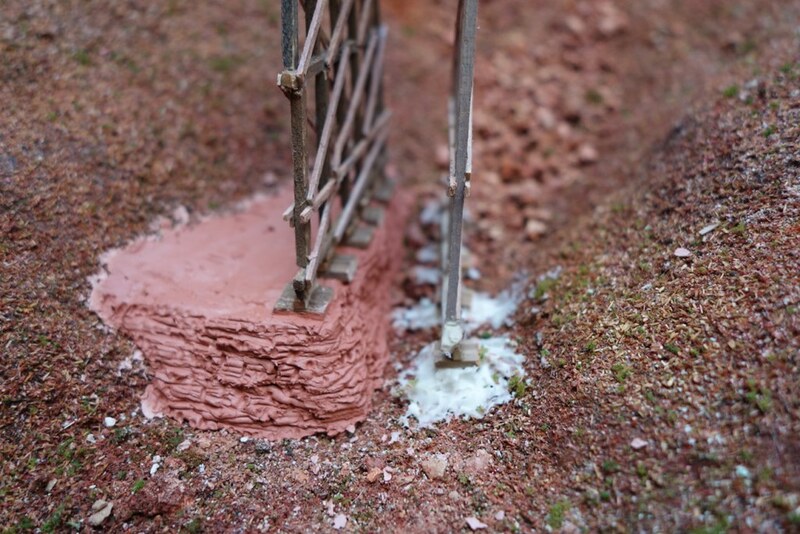 Since in this case there is no “ledge” for the footings, the base of the bent was secured in place by applying very small dabs of NoNails underneath the mud-cills, with any spaces around them then being filled with more small blobs of NoNails being dabbed into place on the end of a piece of scrap wood – then painted and worked-up with ground-cover etc. Lessons learned as I’ve gone along: 1) make the groundwork around the base of the bent good before gluing the cross-braces and girts in place, and 2) there is a pattern to the way each vertical layer of cross-braces alternate their “back” and “front” components. 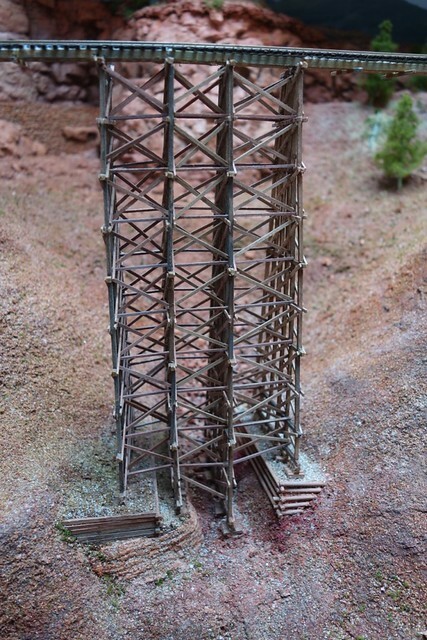 The first photograph below is the (now rather paint-spotted) memory-jogger that I sketched-out to guide me in this process, which I realised only after more haphazardly completing the rear set of cross-bracing on my very first “authentic” tower. Thus the fronts of the two towers now complete are correct, and the incorrectness at the rear of one of them is (I hope) far from noticeable (see final close-up photo). We are (of course) just about to go off for another weeks’ holiday, with subsequent “catch-up” time which will also be modelling-free, but at least thinking has already started around the fourth bent, which will be to the immediate right of the current group (being the longest of all those yet to make). Main self-debate here is about the form of the footing. 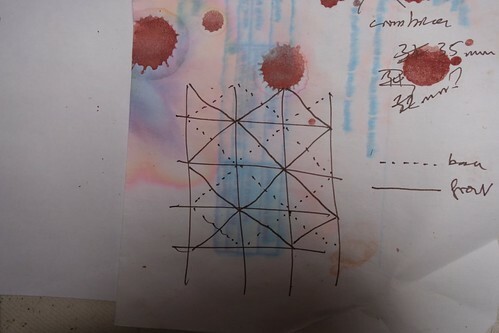 Period and more recent photos of the prototype seem to show a simple earth-banking, while the clip from Breakheart Pass (falsely) implies a form of caisson using alternated logs rather than the solid walls of interlaced timbers common higher up. Somewhat also depends upon the (largely accidental) contours of my base landscape at any given point. So it’s good to have time to think. Much the same procedures and techniques were used as before, but with a few tweaks. 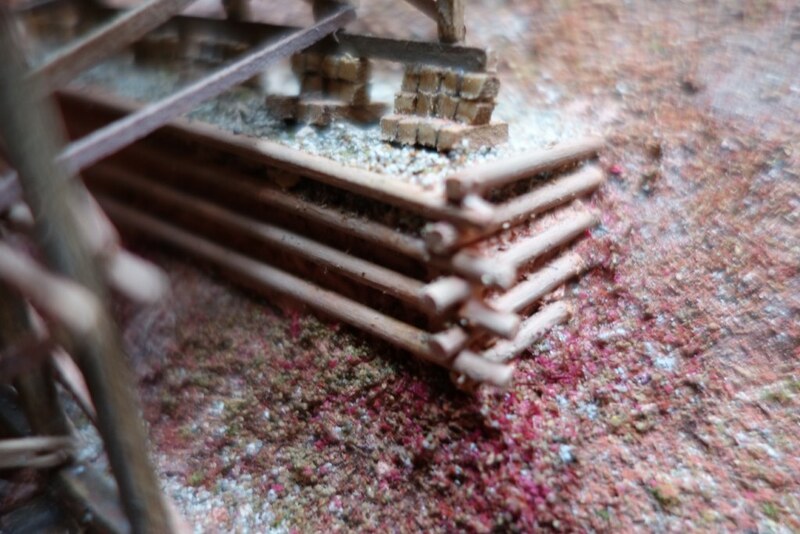 The main difference being the modelling of an “interlaced-log” type caisson for this footing rather than one made from solid beams (see the self-discussion in the previous entry). Round-section “12x12” rods were pressed into the modelling clay while it was still soft, and I found that wetting the rods helped them to stick better initially. 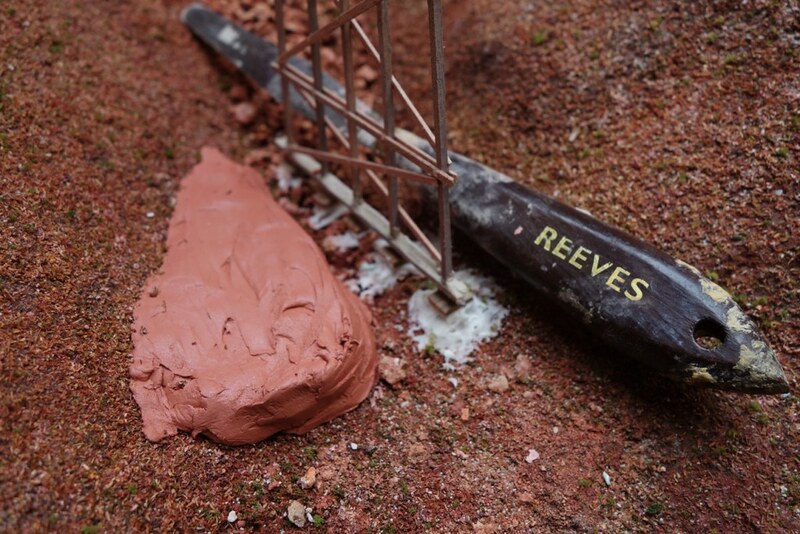 Once the clay had dried some of the rods were still loose, but it was easy enough then to glue them into place in their self-created grooves. 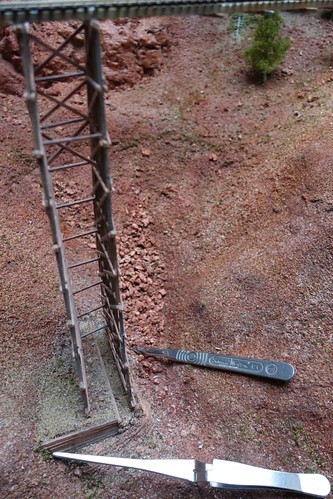 The other changes concerned the modelling of the mud-cills. This time I tried working with just two lengths of “12x12” stuck together side-by-side, it being much easier to chop through this than through the full four-strip width. 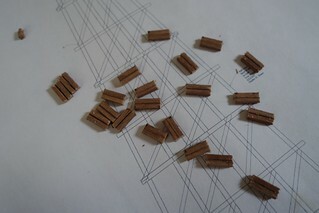 The mud-cills were then assembled from these components much as before. 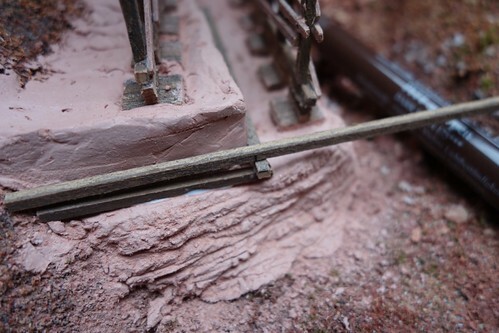 But I then added a “projection” to the bottom of each mud-cill once they were in place on the post-bottoms, with the hope that this would allow me to mount the bent into the modelling clay with the cills themselves standing more proud of the finished surface, less “sunk in”. Good to see your still progressing, or it would be if the photos were there! Even all your earlier shots seems to have just been replaced by script that takes you to flicka but not the actual shot. the images show up fine for me too at the moment, nice work! And now their back - I am using my IPad at the moment and the pics are good, previously I was using my laptop. I will try the laptop again to see if the issue is resolved. 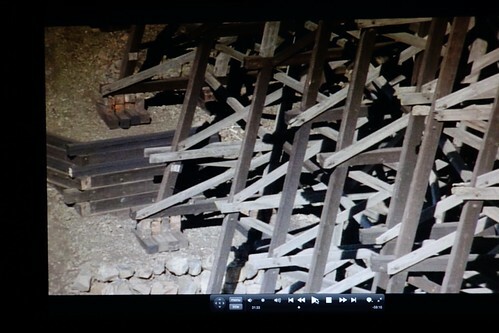 Either way the trestles looking good, lots of small pieces of timber though - don't you just love this Scale!! !